In the most recent newsletter published our landlord, the semi-public housing corporation UR, and deposited in our mailbox there’s a specious “conversation” between a theoretical apartment renter and a theoretical apartment owner about the respective advantages of each mode of living. Discounting the whole economic side of the issue, the most obvious distinction is that owners can “freely change and remodel their apartment and replace or install amenities.” The renter counters by saying it may be nice to change your apartment the way you want, but what a pain in the neck! You have to hire someone to do the work and then move out while the work is being done. And, in any case, you can’t actually change the size of an apartment the way you can a house; whereas with some rentals, (s)he argues, the landlord will gladly remodel the unit to the tenant’s specification before the latter moves in. What’s perplexing about this line of thinking is that, while it may be true in “some” cases, as the speaker says, it isn’t true in the case of UR rentals. You have to take it the way you see it. The only part of the renter’s argument that holds water is that renters have more freedom to choose, meaning once they move in they can always move out and find something more suitable or desirable. Owners don’t have that freedom; or, they do, but it depends on how easily they can sell their property and how much of their initial investment they get back, and those points are hardly guaranteed in Japan. Still, remodeling needs to be addressed. In UR apartments, as with most rental units, tenants are very limited with regard to how they can decorate, since almost all rental agreements include a term that says the tenant must leave the apartment in the exact same state as he or she found it. And while usually contracts don’t specifically say you can’t make holes in the wall, that is how most people interpret it. In any case, we’ve heard of people having had money taken out of their security deposit because of holes in the wall–but then, private landlords will find any excuse to keep that money. In our previous UR apartment we hit on a solution to this problem, almost accidentally. 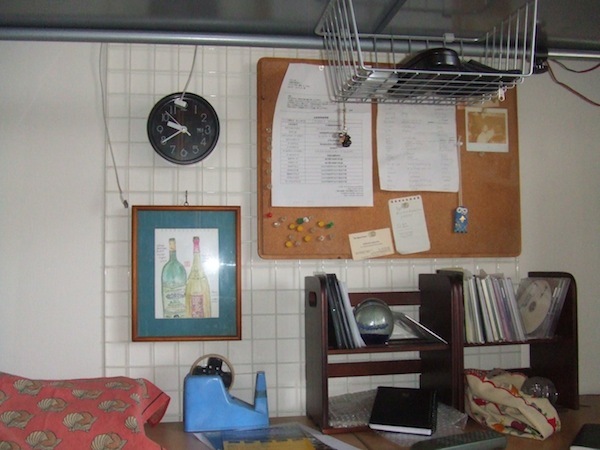 In the past we had got around the no-nail-or-thumbtack proscription by using extendable floor-to-ceiling devices that incorporated metal grid panels, from which you can hang anything you like. These are sort of limited in terms of space, however, and tend to draw attention to themselves. But in our last place we modified the core idea of the panels. 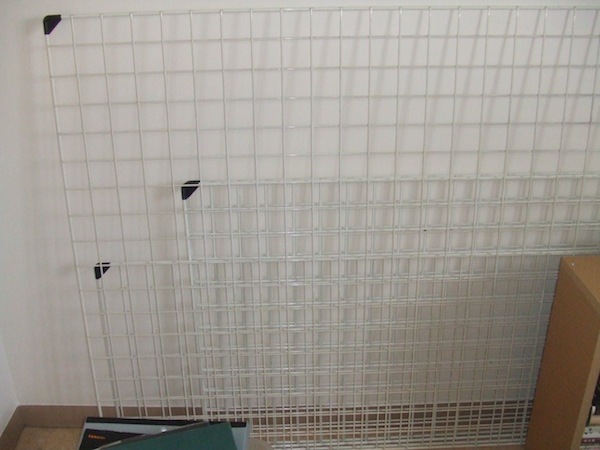 When we moved in there were no screens in outer sliding doors, and before we had someone come in and custom make screens for us we bought large metal grid panels and stuck them in the open doors in order to prevent our two cats from wandering out onto the balconies. It was a makeshift solution until the screens were measured and made, and once they were installed we didn’t need the grids any more, but we found a use for them. In most UR apartments built since the mid-90s–and quite a few non-UR apartments, as well– there are removable studs installed in the walls. 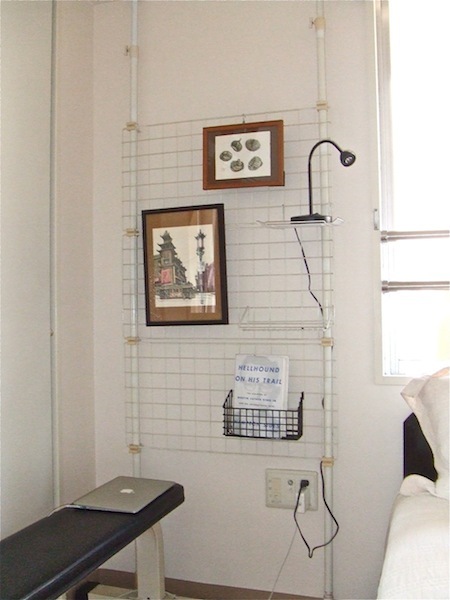 Residents can use these studs to hang pictures and thus not put holes in the walls. The trouble is they’e all at the exact same level, which limits the decorating possibilities. 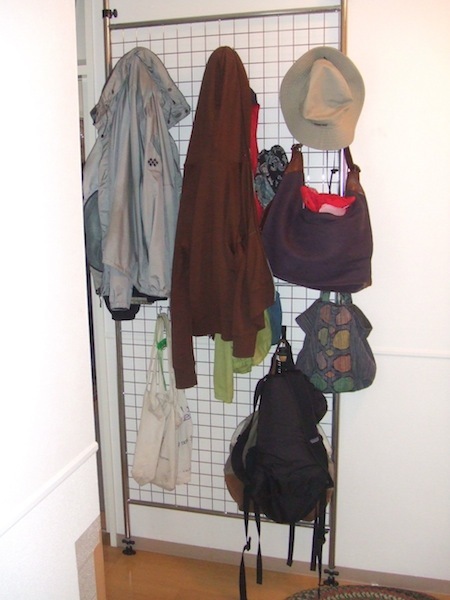 But because they’re at the same level you can hang a grid panel on them horizontally and then use the panel as a matrix from which to hang anything, including lightweight shelves and hooks. We used them all over the apartment and they worked extremely well since the studs have an indentation that secures the panel flush to the wall. The apartment we live in now doesn’t have the studs. 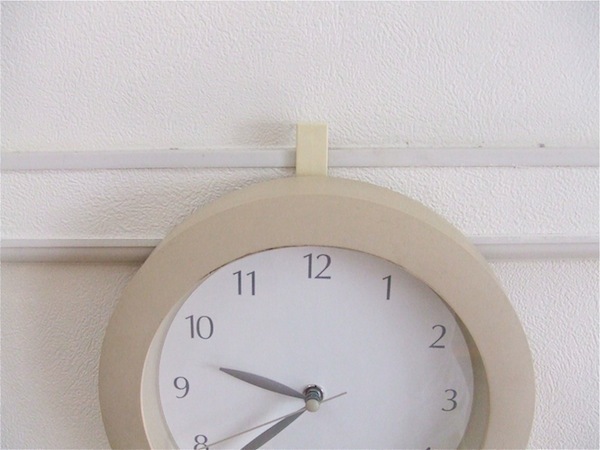 Instead it has horizontal molding set high on the walls with indentations on the top. You can secure hooks via the indentation and hang things, but because the molding juts out a bit you can’t hang grid panels because they won’t be flush to the wall. In a way, it’s OK, though. We’ve gotten to the point where we prefer bare walls. If only they weren’t so damn white. thanks for the advice I didnt know remodeling an apartment in Japan would be so difficult. I am a girl who want to remodel and apartment and would like to incorperate color and have that luxury feel Like stand alone tube and shower and a double vanity.